Course Information One of a few seaside links in Japan and was designed by Seiichi Inoue. 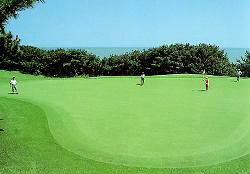 This course is ranked in top 3 golf courses in Japan by many golf magazines including U.S. Golf Digest and E-Golf that is the authoritative judging panel of golf courses in Japan rated No.1 golf course in Japan in 2006. Links along the Pacific Ocean. It features long and spacious fairways lined by age-old black pine trees, some dog-leg holes and big greens. Winds from Pacific Ocean always influence score making. Although it is located little far from Tokyo, please don't miss this gem of Japanese golf courses. Oarai *There are many good Japanese style hotels (Inns) in Oarai.